The game I wrote is entitled Space Opera . 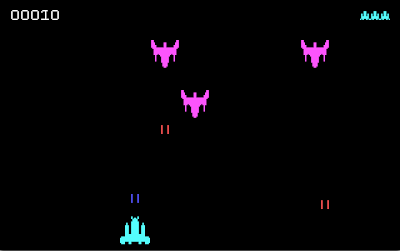 It is a very simple "shoot at the enemies flying down from the top of your screen as you fly through space" game. Being written in assembly, almost every line is commented. You can view the standalone Space Opera source, but you need to download the full package if you want to actually assemble it. The Space Opera binaries and source code are released under the MIT License, however the ZIP file contains some free files with no licensing information including an educational assembler and debugger and a random number generating library. All of these extra files are from the NYU Computer Systems Organization homepage (for Spring 2008) and were given to us to use. I am mirroring them on my servers. That is the extent of the licensing I know of. The compiler and debugger are written by Robert Dewar and the random number generation library is written by Wilson Seto. My code borrows some routines from Robert Dewar's Game Program , another educational file by Robert Dewar, which is free of licensing information and given to us to use. It is available on the course website as well. The sections in my code that have been borrowed are clearly marked as such. In order to run the binaries, cd to the directory (at the DOS command line or in DOSBox if you do not have Windows) and run spopera.bat. If you would like to use the assembler, cd to the src directory and type das.com <source file>. An outputted ".com" and ".lst" file should appear bearing the same name as the source file. The ".lst" file is for debugging and the ".com" file is the executable. Oh man do I love space. Like being in a spaceship. And eating dehydrated ice cream. And eating moon cheese with my dog Grommit. Good times, man. Good timez.